The sun appears to move around the earth along a 360 degree path called “the ecliptic”. The Zodiac is a belt of stars which parallels that path. The word “Zodiac” comes from the ancient greek “kuklos zodiacon”, meaning circle of sculptured animals. Ancient astrologers divided this belt into 12 sections of 30 degrees with a zodiac “sign” sitting in each division. Aries is always the first sign of the zodiac as it equates with the northern hemisphere spring equinox and hence the start of the life cycle for farming communities. Aries is followed by Taurus, Gemini, Cancer, Leo, Virgo, Libra, Scorpio, Sagittarius, Capricorn, Aquarius and finally Pisces. Cycles. 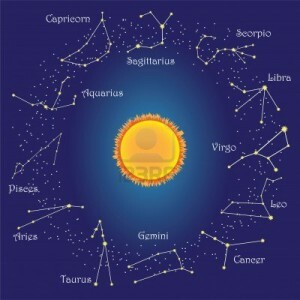 Astrology has often been defined as the study of cycles. Just as we can understand the farming cycle of planting, growing, harvesting and laying fallow, so can the twelve signs of the Zodiac be symbolic of human life and development. Aries is the new born babe, Taurus takes his first steps in his immediate environment, Gemini his first words, Cancer his idea of family and roots, Leo the knowledge that there is a “self” that needs to be satisfied, Virgo understands that there is something beyond self, there are others that need attention, there is obligation and duty. Libra is always trying to find the balance between keeping others happy while at the same time considering self. Scorpio realises that man in not immortal and needs to probe deep to face his gods and demons. Sagittarius, having been released from the underworld, is full of new ideas and visions for a better place. Capricorn takes these visions and moulds them into a workable practicality. Aquarius then takes these formed visions out to humanity to try to make a better world and finally Pisces represents the letting go of earthly ties, finding a spirituality within that will eventually lead back to the source. And then the cycle starts anew. A new Aries babe is born. The twelve signs are divided into four elements (fire, earth, air, water) and three qualities (cardinal, fixed and mutable). Fire signs (Aries, Leo and Sagittarius) are active and enthusiastic. They need above all to be free. Earth signs (Taurus, Virgo and Capricorn) are practical and cautious. They need above all to be “in control”. Air signs (Gemini, Libra and Aquarius) are communicative and sociable. They need above all to communicate and think. Water signs (Cancer, Scorpio and Pisces) are sensitive and impressionable. They need above all to feel connected.